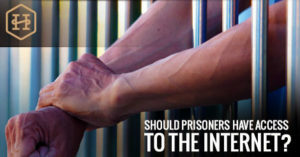 Home » Florida Crime News » Should Prisoners Have Access to the Internet? Currently, only four states allow some type of limited internet access (Florida not included) to prisoners. However, some make the argument that internet access is a basic human necessity and the denial of this is a rejection of the person’s human rights. The argument of the need for internet access while in prison increased when an inmate, Michael Santos, finished a 25 year sentence. He stated that those in the outside world should have access to what life is like in prison. Prisoners often don’t have internet access. This disrupts the chances for a successful rehabilitation upon release and silences them in worldwide conversations. Denying prisoners their voice online allows the world to completely forget about their existence. Not only that, but prisoners are often victims of abuse that no one ever hears about. Is this an Issue of Human Rights? There are thousands of prisoners who have illegal accounts due to contraband in the prisons, such as cellphones. This means that this inability to interact with the outside world is not completely impossible. Also, one of the main reasons this internet access is restricted is due to the potential of prisoners targeting victims. Academics and professional often debate whether or not this is an issue of human rights. There are individuals who are for and against this right, which makes it one that is still highly controversial. Scholars and specialists have a hard time determining if the internet is a fundamental human right. Even though all incarcerated prisoners still have the right of freedom of speech. However, denying prisoners what is going on in the world negates their ability to survive in a world that has continued on. It also disallows them to adequately cope with life in prison. If you have recently been charged with a crime, or believe that you may be charged with one, then hiring an experienced criminal defense lawyer in Miami is a smart move. They can handle the case and discuss your situation. If you have questions, or need more information about your rights, contact The Hansen Law Firm today.